In the center of St.-Petersburg, on the small island of the river Neva, the stone walls of the Peter and Paul Fortress are -they were the first construction of the city. 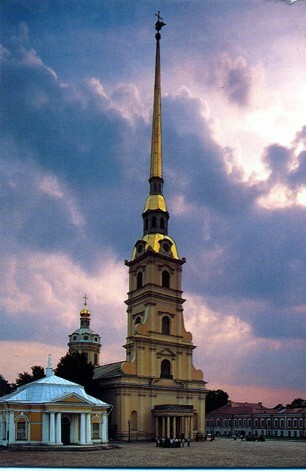 The Peter and Paul Fortress was founded during Northern war with Sweden (1700-1721). The war was waged for returning Nevskiy and Baltic grounds (originally Russian) grasped by Sweden in the beginning of XVII century. These grounds were a part of possession of Great Novgorod, in IX century a part of a great way " from varjags to Greeks " stretched there. Absence of exit to Baltic sea hampered the development of economy of Russian state, and also necessary political, trading and cultural communications with the countries of the Western Europe. To the beginning of XVIII century returning of the Baltic coast became historical necessity for Russian state. Northern war begun for Russia unsuccessfully: near Narva in 1700 Russian army was defeated. But failures did not stop Peter 1 perfectly understanding historical necessity of the returning of exit to the sea. In 1702-1703 Russian armies gained the first victories over Swedes. These years military actions were waged in area of Ladoga lake and upper waters of Neva river. There was a Swedish fortress Noteburg on a small island in the place where Neva starts. It was founded by Novgorod inhabitants in XIII century and before had a name Oreshek (Nutlet ). In October, 1702 after fortnight siege Russian armies seized the fortress Oreshek. After Peter 1 wrote about its capture the following: " However hard that nut was but thank God, it was happily cracked open. Our artillery corrected wonderfully its mistakes ". The fortress Oreshek (Noteburg) was renamed into Shlisselburg - the Key-city. It really was a key to exit to the sea. In April, 1703 Russians captured other Swedish fortress - the Nienschanz, located where the river Okhta (the deep and wide river that time) flowed into the Neva river. The Nienschanz was strong Swedish strengthening with five bastions, with the numerous fortress constructions erected by the all rules of the fortificational art. Russian artillery played leading role in assault of the fortress: it`s devastating fire made Swedish garrison surrender. This success of the young Russian artillery, created in a short term by heroic efforts, was supported by the victory of Russian ships over Swedish ones in a mouth of Neva in the beginning of May. 1703. The exit to the sea was returned. It was necessary to strengthen it and to create a powerful fortress. The fortress Nienschanz could not provide defense of the mouth of Neva: it was settled far from the sea. On a military council the decision to search for a place for the new fortress was accepted. The councils chose one of the islands of Neva located at division of the river in three sleeves: the Great Nevka, the Great Neva and the Small Neva. The island's name was Enisari (Hare`s) or Ljust Elant (Cheerful island). The situation of the island was convenient from the military point of view. Wide and deep Neva functioned as protection of the fortress, and the fortress itself covered the exit to Neva from Finland gulf, and it was possible to conduct bombardment of territory over the considerable distance from its walls. Rather small size of the island allowed to build the fortress so that "no any extra land left" and the enemy could not make a landing on its walls. 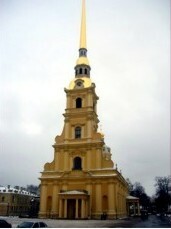 Peter 1 took considerable part in designing the Peter and Paul Fortress. Contours of the fortress were determined by natural outlines of coast of the Hare`s island. It got the form of the extended hexagon with six protruded corner bastions which allowed to conduct mass face-to-face and flank artillery bombardment of fortress's approaches. Peter's 1 associates: A.D.Menshikov, G.I.Golovkin, Zotov, Trubetskoj, K.A.Naryshkin - kept an eye on the construction. The fortress bastions were named after their names. One of the bastions was named in honour of Peter 1 – Gosudarev (Your Majesty's). The bastions connect with each other by the walls - “Kurtiny”. There are six of them there, as well as the bastions: Petrovskaja, Nevskaja, Ekaterininskaja, Vasilevskaja, Nikolskaja, Kronverkskaja. The drawing, which was in Peter 1 collection, was kept. There is the plan of the Hare's island with the contour of the fortress in that drawing. The island was small – length about 750 meters and width about 360 meters. To increase its sizes, artificial embankment sites were created. Construction of the fortress was conducting during the war with Swedes. Swedish general Majdel made a report to Stockholm on July, 24th, 1704: " Petersburg is very well based and strengthened, its position is those, that it can become a strong fortress and a prosperous trading city at the same time. If the tsar keep it within several years their forces at the sea will become very powerful". In 1704 when Swedish group in 8000 persons and a squadron of 12 vessels approached Petersburg and Kronshlot, Russian armies beat off the opponent without suffering any particular losses. Swedes was beaten off again next year having great losses while had been attempting to seize the city and the fortress. 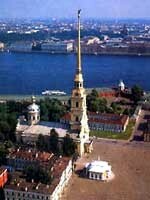 Reorganization of the Peter and Paul Fortress in stone one began on May, 30th, 1706 and continue till 1740 with several breaks. Destruction of the earthen fortress and erection of the new pile based walls made of bricks and stones was made gradually (it was hammered about 40000 piles under the stone walls of the fortress ), on small sites so that the fortress would not lose its defensive ability. Southern bastions were placed further in a channel of Neva. Manual skills prevailed at the construction of the fortress, but at more difficult hydro technical works they used “kopri” (special machines to hammer the piles), horse-drawn waterpouring machines and many other things. The great excavations were conducted. Their amount was equal almost to 250 000 square metres. The newspaper "Vedomosti" informed in the autumn of 1703 that there worked 20 000 diggers in that fortress. Building materials were brought up on the special vessels. In 1709 there were 205 such vessels and 7623 loaders under the management of commandant of the fortress Bruce. The architect Domeniko Trezini became the executor of Peter`s 1 will at the construction of the stone fortress. Bieng Italian by origin, he was born in Switzerland, for several years had been working as the architect at a court yard of the Danish king. In 1703 Trezini came to Saint Petersburg, having accepted the offer of Russian diplomat in Denmark Izmaylov who under Peter's 1 order found and invited to work to Russia fortificators and architects. Trezini was the first architect of young capital. Since 1706 he started "the first work of the main ones " - reorganization of the Peter and Paul Fortress to stone one and erection of various constructions on its territory, he devoted almost 30 years of his life to that work. The fortress was created as the first class military-engineering construction of XVIII century. Bastions and « kurtini» are made of bricks and stones. Their height is 10 - 12 metres, width - up to 20 metres. They consist of two walls: external («eskarpovaya») it`s thickness up to 8 meters and internal (“valgangovaya”) thickness of 2 metres. Space between external and internal walls in bastions' “fases” ( “fases”- the parties of a bastion turned to the enemy) was filled with sand, rubble and ground. 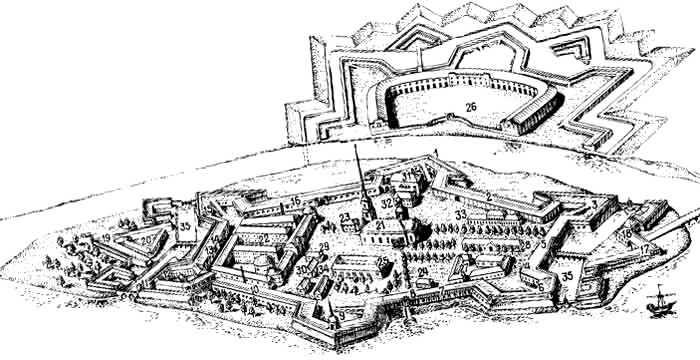 There were arranged “casemates” (cells) with the embrasures intended for installation of guns in the bastions` “flanks” ( “flanks”- lateral sides of a bastion, unite “fases” with “kyrtini”). Casemates in “kyrtini” served for storage of an ammunition, arms and for accommodation of garrison. The fortress was impregnable owing to deep Neva from the southeast, and from the north it was protected by strait and additional constructions – earthen “kronverk” and “Kavaljer”. Kronverk (auxiliary strengthening consisting of one bastion and two semibastions connected with kurtini) was intended for covering and support with artillery fire of a significant part of the fortification. It was built in 1705 - 1708. It`s earth walls was covered with turf by August 1708. There were 78 guns on them. Earth walls were surrounded by moat with water. Kavaljer (is an auxiliary construction inside the bastion; served for bombardment of territory in front of the fortress)was built on the territory of Golovkin bastion. There was dug a channel along the island, length 400 metres and width 5 metres. Building materials were brought up on it. In 1882 the channel was filled up. In 1731 and 1733 begun the erection of stone ravelins (a ravelin is an auxiliary construction located in front of kurtini and between two bastions); they covered the fortress's gate and kurtini from fire of artillery. Their construction was finished in 1740. Ioannovsky ravelin was built on eastern part of the fortress, named in honour of senior brother Peter 1 - Ivan Alekseevich. It covered Gosudarev and Menshikov bastions, Petrovskaya kurtina and Peter`s gate. Alekseevsky ravelin was built on the western part of the fortress, named in honour of father of Peter I - tsar Alexey Mihajlovich. The ravelin covered Trubetskoj and Zotov bastions, Vasilevskaja kurtina and Vasilev`s gate. Ravelins were separated from the territory of the fortress by moats with water. Drawbridges were built under the moats. In the end of XIX century the moats were filled up. But construction works in the fortress continued and later on..
Time had been passing and the brick walls began to collapse because of bad weather. In 70 - 80th years of XVIII century walls of the fortress were faces by granite from the side of Neva over 700 meters. Since then the granite walls of the fortress with flying up golden spire of the Peter and Paul cathedral became a part of the majestic architectural ensemble which was set up on the coast of Neva. The victories of Russian army over Swedes near Poltava in 1709 and near Vyborg in 1710 played great role in the future of the fortress and the young city, the victory near Poltava, as Peter 1 said, was " a stone in the basis of St.-Petersburg ", and during the capture of Vyborg " the strong pillow at the head of the bed of St.-Petersburg was put". The exit to the sea was protected by Kronstadt fortress based in 1704 on island Kotlin. In the beginning of XIX century when the Great Finnish princedom became a part of Russia, the border of Petersburg was moved to the northwest. The fortress was inspected and alerted during wars . In Patriotic war of 1812 and Crimean war of 1853 - 1856 there were increased the number of guns on the fortifications. The history of the Peter and Paul Fortress turned out so, that after reconstruction in stone one it had not to take part in military operations against the external enemy. 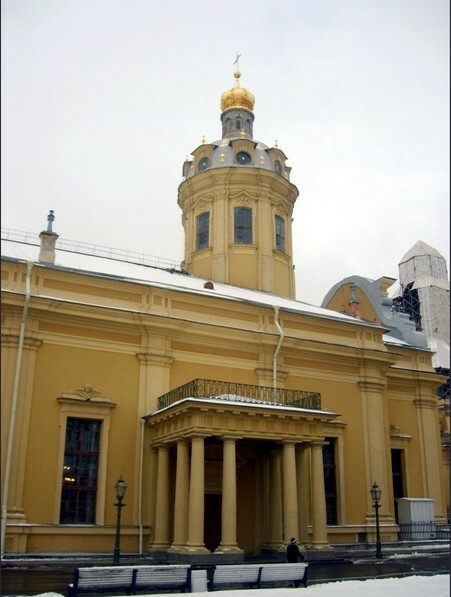 In XVIII - XIX centuries the Peter and Paul cathedral, the Commandant's house, the Engineering business court yard, Botnyj house, the Mint and other buildings of various purpose was constructed on the territory of the fortress . The history of the Peter and Paul Fortress is a bright page in history of struggle of Russian people for primordial Russian lands, for the exit to Baltic sea. Also the history of Russian revolutionary liberation movement, the history of struggle against autocracy and a serfdom: for 200 years the Peter and Paul Fortress was a place of punishment (“tsarism”) of the best, progressive people of Russia. Three generations of revolutionaries - decembrists, raznochinci and proletarian revolutionaries had passed through the prisons and casemates of " Russian Bastile "
Today the Peter and Paul Fortress is one of the most valuable historico-revolutionary and architectural monuments of St.-Petersburg and one of the largest museums of the country.